Earlier at the Hilton, the president also talked sports, saying his remarks would be brief because of the Blackhawks' Game 7 playoff contest at the United Center. 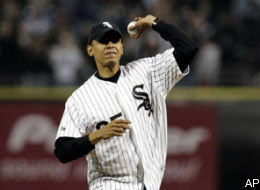 He also said he expects the White Sox to win the Crosstown Classic. "I'm not a Cubs hater, I'm just saying," Obama said. "I think the Sox will win." The Sox, however, lost again to the Cubs on Wednesday. In their infinite wisdom, Major League Baseball decides to reduce the Crosstown Classic to four games each year from six games, so the teams can split the series instead of reducing it to five games perhaps thereby making sure that one team will always be declared a winner of the Crosstown Classic. The Cubs need to sweep both this year, and next year's games to even up the all-time record. Going into the Chi-town series, the White Sox were climbing back to .500 by sweeping the Miami Marlins. They were only 4 games back of the Detroit Tigers and looked to keep their momentum going at home against the flailing Cubs who stopped a six game losing streak by rallying to beat the Red 5-4 in 10 innings after Johnny Cueto decides to do the "stupid" and throw at David DeJesus supposedly for taking too much time to get into the batter's box in the first inning. The Cubs had been completely dead before then and perhaps that little act of idiocy gave them the spark they needed. The Cubs outscored the White Sox 32-8 during the 4 game sweep. Jeff Samardzija goes the distance and gives up a career low of 2 hits to win his 3rd game of the year. The "shark" also strikes out 8 and only walks two, and puts an end to the White Sox streak and gives the Cubs a 2 game winning streak after losing six straight. The White Sox have spotty defense at times and Julio Borbon hits his first HR of the year a 2 run shot that put the Cubs up 3-0. The Cubs top 4 spots in the lineup bang out all 9 of their hits. Jose Quintana takes the loss and moves to 3-2, giving up 4ER in 6 IP. Next up for the Cubs, Sox Ace Chris Sale. Pitches-strikes: Samardzija 108-65, Quintana 95-56, Jones, N 21-16, Omogrosso 29-18. Groundouts-flyouts: Samardzija 8-6, Quintana 5-4, Jones, N 0-1, Omogrosso 1-2. Batters faced: Samardzija 30, Quintana 25, Jones, N 7, Omogrosso 7. Umpires: HP: Scott Barry. 1B: Tim Welke. 2B: Clint Fagan. 3B: Mike Everitt. Wellington Castillo hits a 2 run HR knocking in Scott Hairston to put the Cubs up 2-0 in the 2nd. Rain delay in the bottom of the 3rd, Cubs still up 2-0. GAME #2 CALLED DUE TO POURING RAIN - MAKEUP DATE - July 8th at 7:10 pm. Dioner Navarro Day at Wrigley - Switching hitting catcher hits 3 HR's and knocks in 6. The winds of change continued to push the Cubs back towards .500 in the Crosstown Classic all time history, now at 49 for the White Sox and 44 for the Cubs. Travis Wood continues to shine both on the mound and in the batter's box, this time hitting his 2nd HR of the year - a Grand Slam in fact off of Jake Peavy even. Homers abound for the Cubs in this typical hot and humid windblown game, with dingers from Travis Wood, Nate Schierholtz, and Luis Valbuena. Jake Peavy gets hit pretty hard by giving up 8 hits in 4 innings, surrendering 6 runs while walking none (normally a great sign when it's that windy) and striking out 3. Konerko and De Aza both picked up two hits, while Konerko knocked in two of the Sox's runs. Cubs' hot hitters of the day were Wellington Castillo (2-4), Luis Valbuena (3-4, HR), Nate Schierholtz (HR), and Travis Wood (2-4, HR, 4 RBI - and hitting .292 for the year). I'm sure Dioner Navarro was licking his chops when he saw the wind blowing the way it was, and with him hitting 3 HR's yesterday. Wind was blowing out at 24 MPH. With the game tied at 2 through seven innings the Cubs bust the game open in the top of the 8th against the Sox's bullpen hurlers of Thornton and Jones with four singles, two walks and a double. Luis Valbuena, a last minute replacement for Wellington Castillo who was 'under the weather' (good description for a game that was once again delayed by rain), knocked in three runs. Alfonso Soriano continued his hot hitting going 3-4, with another HR, and Matt Garza displayed all he has to offer to the scouts who were there to see his 'stuff' in case the Cubs decide to trade him. Garza went 7IP, giving up 5 hits, 2 runs (1 earned) and striking out 6. Hector Santiago of the Sox throws 5 1/3, giving up 5 hits, 2ER, walks 2 and strikes out 3. Rookie catcher Josh Phegley becomes the Sox player to hit a HR in the first pitch he saw at U.S. Cellular Field, his 2nd dinger in as many games. Before interleague play in 1997, the White Sox and the Cubs often played in exhibition games. The White Sox and their South Side fans invade Wrigley and the North Siders travel via the Dan Ryan, Lake Shore Drive, or the "El" (the subway) via the Red Line to U.S. Cellular Field. Most of these exhibition games were filled with "call ups", those being minor league players as the teams did not wish to have their regular players injured in an exhibition game. Thusly, these games, although intense in the fans eyes, were merely entertainment. Then in 1997, it finally counted. The first two years of these games (1997 & 1998), there were only 3 games for the entire season, with the home team alternating. Then in 1999, MLB introduced the current series of the games, in which there are 3 games at each park each year. Although the teams had a similar record against each other in this series (they were tied going into 2009), there is nothing similar about either team in the eyes of their fans. 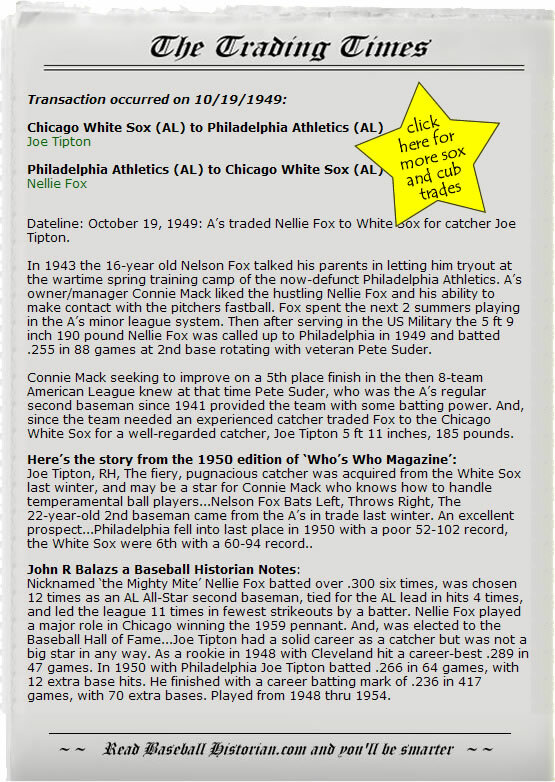 With the Cubs having not won a World Series in over 100 years, and the White Sox finally having broken their long drought in 2005 (an 88 year wait), the "palehose" have an advantage in recent bragging rights with their World Series win.